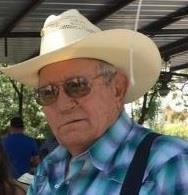 Jerral James Holden of Caballo, New Mexico peacefully passed away December 3, 2018 at the age of 76, in his home. Jerral was born in Oklahoma City on September 26, 1942. Jerral was raised on the family ranch in Caballo, New Mexico. Once he retired from White Sands Missile Range, he and Nina (wife of 45 years), purchased a home in Caballo. He loved gold panning, treasure hunting, working with wood, hunting, gardening and anything he could do outdoors and with his hands. He was a collector of many things, but his coin collection was his most treasured. Jerral was drafted into the US Army soon after graduating high school, and proudly served his country in the Vietnam War as an infantryman in the 1st Division. Jerral was met at heavens gates by his wife Nina Mae Holden of 45 years, his daddy Joel J Holden “Joe Buck”, step mom Beulah Holden, sister Kathleen Hills and brother in law Earl Hills, sister Patricia Spitzer and step father Charles Crockett. He left here on earth his step son, James Justin Tharp (Jay) and his wife Dina, of Las Cruces, New Mexico; his two granddaughters: Cheyenne Molinar and husband Kurtis of San Antonio, Texas and Dakota Lopez and husband Greg, of Las Cruces, New Mexico; his two Great Grandsons, Kason James Molinar and Braxton Blaine Lopez; his mother Madiline Crockett; sister Betty Nuanes and her daughter Bree Jaramillo and his niece Joleen Baughman and her daughter Lana and son Tyler. Jerral loved his granddaughters and great grandsons. They were the highlight of each and every day. When the girls sent text messages with videos of the boys, Jerral (granddad) would watch the videos over and over. If he was having a bad day, he would just watch videos of the boys and smile. He loved his great grandsons so much and even when his health was failing he always did everything he could to spend time with them. His day was not complete until he said goodnight to the grand girls, great grand boys and son Justin. Jerral (granddad) will be greatly missed by all who had the privilege of meeting him. Cremation has taken place and Jerral will be laid to rest at the Caballo Cemetery on Saturday, December 8, 2018 at 11:00 A.M. at a Graveside Services officiated by Rev. Thomas P. Jones. The family would like everyone to join them at the Caballo Church, 14664 NM-187, Caballo, NM directly following the services. You will be dearly missed Uncle Jerral. I love you, but I know your heart was to broken to live on without Nina. Rest in Peace. Deeply saddened to hear of your passing. Wish we could have had that cup of coffee. Your Son. So grateful to have been able to spend time with Jerral and his family prior to his passing. He always enjoyed teasing me - and that will be sorely missed. You were a good man on this earth and I suspect you'll be an even better angel in heaven.